OS grid ref: HY 4882 5270. 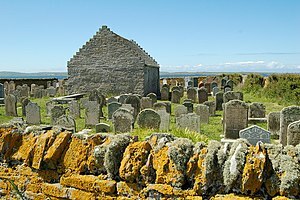 At the far north-west corner of Papa Westray overlooking the cliffs of Runnapitten, about half a mile north of the hamlet of Holland and a little to the west of Kirk house, stands the tiny medieval church of St Boniface. This was the site of a 7th or 8th century monastery and the probable site of a Pictish settlement. But the area around the church also has some Bronze-Age and Iron-Age antiquities – there was a 10 foot high prehistoric roundhouse, or broch? just east of the church where an Iron-Age settlement existed, though nothing much remains of that now apart from the earthworks. In the churchyard of St Boniface’s there is a Viking hog-back gravestone which would, also, mean there was a Viking settlement here, and part of an early Pictish cross-slab – originally there were two stones with crosses carved onto them excavated in the church-yard. These were removed for safety to nearby museums. The little church (kirk) dates from the 12th century but there was probably a monastery on the site back in the 7th or 8th century AD, founded by St Boniface, bishop of Ross in Scotland; indeed the place is sometimes called Munkerhouse (monks house). St Boniface and his Celtic monks would have served the Pictish community here and converted this dark age tribe to christianity at the beginning of the 7th century. Historians place the death of St Boniface at c630 AD, though some have placed his death in the early 8th century. He founded over one hundred churches in the north of Scotland, including the one on Papa Westray, Orkney. His feast-day is given as 14th March. In 1700 the little church was enlarged, but by 1930 it had been abandoned and left to become ruinous. However, in 1993 it was fully restored both inside and out, and is now in use once again for services. Close to the churchyard wall, amongst more modern gravestones, there is a Viking hog-back tomb stone from the 11th or 12th century? although this is now very worn and it is difficult to see any of the carving. According to legend, this marked the grave of Earl Rognavald Brusison who was the nephew of St Magnus the martyr of Kirkwall. Close by, part of a Pictish cross-slab; the main part of the stone being removed for safety to the National Museum of Scotland at Edinburgh. This slab was carved with a circular cross and also an incised cross. In 1966 a second Pictish cross-slab was excavated from the north-east corner of the churchyard. This had a Pictish-style cross and a circle with a small decorative cross inside, but for safety reasons is now housed in the Tankerness House Museum in Kirkwall. Tait, Charles., The Orkney Guide Book (Edition 2.1), Charles Tait Photographic, Kelton, St.Ola, Orkney, 1999. Armit, Ian., Celtic Scotland, B T Batsford, London, 2005. Categories: Ancient Churches / Chapels, Ancient Crosses, St Boniface Papa Westray Orkney | Tags: Ancient Crosses, St Boniface Kirk at Papa Westray in Orkney | Permalink.